You are currently browsing the category archive for the ‘Lake Jacksonville bridge’ category. The City of Jacksonville has built a recreational trail on the north side of Lake Jacksonville. The Friends of the Trails Initiative of the Jacksonville Park Foundation invites the community to learn and love the path through new Sunday Strolls. Park in the boat launch lot. Walk, run, or ride – bring the whole family. No official start. The goal is simply to have a concentration of people on a promenade to encourage interaction on the recreational trail. Restroom facilities located at concession building near the boat dock. Walkers have right of way. Bicycles yield to people on foot. Campers with permit can ride golf carts, and they must yield to people walking, running or biking. Read more about the City of Jacksonville’s grant application to complete the final stage of the recreational trail (Exhibit F (partial), G+H in map above). Lake Jacksonville Pedestrian & Bike Path (under construction, Feb. 2019). Help the City of Jacksonville beef up its application for a state grant to complete the Lake Jacksonville Pedestrian and Bike Path. 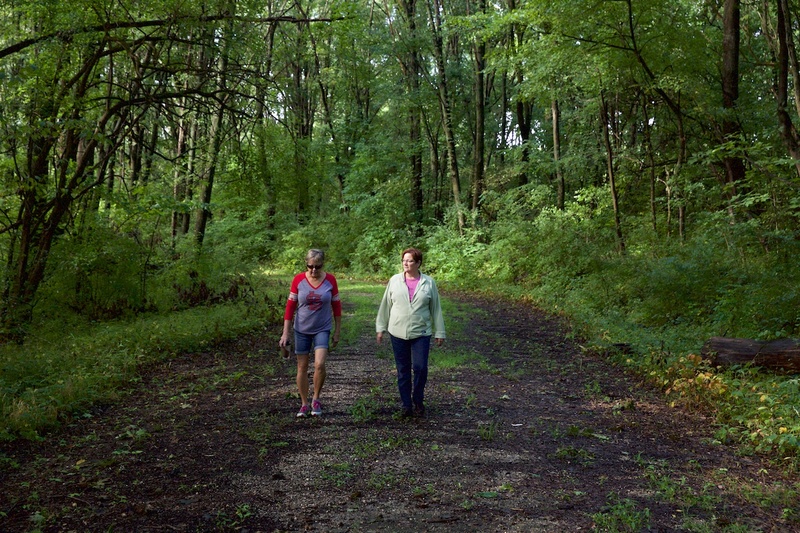 The City of Jacksonville voted unanimously to apply for a state grant via the Illinois Department of Natural Resources for the final phase of the Lake Jacksonville Recreational Trail. The grant will cover 80% of the cost. You can help improve our chances of landing the state grant by signing on now, for the deadline is in the 2nd week of March. Better: Email a note stating “I support the City of Jacksonville’s effort to use a IDNR RTP Grant to complete a Lake Jacksonville Pedestrian and Bike Path” to trail19@jaxpark.org. Feel free to expand with information about your interest in the lake, nature, community, health, and the like. Bonus if you can get your group or company to send a letter, saying how the trail could benefit the community. Best: Recruit people to do the above, and/or download a petition and get people to sign. Scan and send to trail19@jaxpark.org. Send email, mail or drop off by Monday March 11 to trail19@jaxpark.org or Greg Hillis, Benton & Associates, 1970 W Lafayette Ave, Jacksonville, IL 62650. Jacksonville Park Foundation board member Peggy Davidsmeyer gives a tour of the trail leading to the Lake Jacksonville walk/run/ride bridge to cyclist Sandy Ballard. The vote for a walk/run/ride bridge at Lake Jacksonville is scheduled for Monday night 12 September 2016, and a show of support is needed to get this item passed. Plans available to download from DropBox. With the bridge complete hikers/runners/riders will be able to go around the lake without risking IL-267. And families with small kids will have about a mile stretch of no/low+slow traffic road to walk or ride together in the woods. What you can do . . . Contact the Mayor and your aldermen (directory link) and express your support of the bridge, your experience visiting trails in other towns (and going to restaurants, shops and other pocketbook adventures while you were there). This project will not only be good for community health but also for the local economy. Meeting 6pm Monday, 2nd floor of city hall. Process starts with study session, then vote comes later when meeting moves next door to council chambers. Keep in mind the history on this . . . When this walk/run/ride bridge came to the fore 2 years ago some residents of the lake subdivisions went through their county representatives to stop the project. The city attorney determined all this was on city land, and planning could progress. After that and committee meetings former Parks & Lakes Chairman Alderman Bruce McDaniel asked Benton & Associates to donate a design for the bridge (thanks!). That info and budget was used to request needed funds as part of this year’s city capital budget, and the bridge survived a challenge at that point. Lately the counter argument has been the city needs to first do a trail to get campers to the concession stand and even around the entire lake, with the bridge as the final step — even though a lake trail has been kicked around since a 2003 city/county bike plan and for at least a decade as part of the city’s comprehensive plan, with no action. Let’s pick the low-hanging fruit . . . Put in this bridge. Get a short trail for families to walk or ride. Get a way for confident bikers get around the lake on county roads without becoming roadkill on 267. Let the mountain bike club and others start volunteering to create trails at the lake which don’t require people to scramble over slippery concrete at the spillway to ford Big Sandy Creek. Get fishers easier access to more shoreline. Build on the short stretch for a trail around the lake or eventually a path into town. Open the lake for walking, running, cycling — for those who camp at the lake, and for the general city populace.